These highlights do not include all the information needed to use NUZYRA™ safely and effectively. See full prescribing information for NUZYRA. See full prescribing information for the preparation of NUZYRA IV and other administration instructions. (2.1, 2.5). Inhibition of Bone Growth: The use of NUZYRA during the second and third trimester of pregnancy, infancy and childhood up to the age of 8 years may cause reversible inhibition of bone growth. (5.3, 8.1, 8.4). NUZYRA is indicated for the treatment of adult patients with community-acquired bacterial pneumonia (CABP) caused by the following susceptible microorganisms: Streptococcus pneumoniae, Staphylococcus aureus (methicillin-susceptible isolates), Haemophilus influenzae, Haemophilus parainfluenzae, Klebsiella pneumoniae, Legionella pneumophila, Mycoplasma pneumoniae, and Chlamydophila pneumoniae. NUZYRA is indicated for the treatment of adult patients with acute bacterial skin and skin structure infections (ABSSSI) caused by the following susceptible microorganisms: Staphylococcus aureus (methicillin-susceptible and -resistant isolates), Staphylococcus lugdunensis, Streptococcus pyogenes, Streptococcus anginosus grp. (includes S. anginosus, S. intermedius, and S. constellatus), Enterococcus faecalis, Enterobacter cloacae, and Klebsiella pneumoniae. To reduce the development of drug-resistant bacteria and maintain the effectiveness of NUZYRA and other antibacterial drugs, NUZYRA should be used only to treat or prevent infections that are proven or strongly suspected to be caused by susceptible bacteria. When culture and susceptibility information are available, they should be considered in selecting or modifying antibacterial therapy. In the absence of such data, local epidemiology and susceptibility patterns may contribute to the empiric selection of therapy. NUZYRA for Injection: Do NOT administer NUZYRA for injection with any solution containing multivalent cations, e.g., calcium and magnesium, through the same intravenous line [see Drug Interactions (7.2)]. Co-infusion with other medications has not been studied [see Dosage and Administration (2.5)]. NUZYRA Tablets: Fast for at least 4 hours and then take with water. After oral dosing, no food or drink (except water) is to be consumed for 2 hours and no dairy products, antacids, or multivitamins for 4 hours [see Drug Interactions (7.2) and Clinical Pharmacology (12.3)]. For treatment of adults with CABP the recommended dosage regimen of NUZYRA is described in Table 1 below. Use NUZYRA for injection administered by intravenous infusion for the loading dose in CABP patients. 200 mg by intravenous infusion over 60 minutes on day 1. 100 mg by intravenous infusion over 30 minutes, twice on day 1. 100 mg by intravenous infusion over 30 minutes once daily. For treatment of adults with ABSSSI, the recommended dosage regimen of NUZYRA is described in Table 2 below. Use NUZYRA for injection administered by intravenous infusion or NUZYRA tablets orally administered for the loading dose in ABSSSI patients. 450 mg orally once a day on day 1 and day 2. 300 mg orally once daily. No dosage adjustment is warranted in patients with renal or hepatic impairment [see Clinical Pharmacology (12.3)]. NUZYRA must be reconstituted and then further diluted under aseptic conditions. To prepare the required dose for intravenous infusion, reconstitute and dilute the appropriate number of vials, as determined from Table 3 below. Reconstitute each 100 mg vial of NUZYRA with 5 mL of Sterile Water for Injection. Gently swirl the contents and let the vial stand until the cake has completely dissolved and any foam disperses. Do not shake the vial. The reconstituted NUZYRA solution should be yellow to dark orange in color; if not, the solution should be discarded. Visually inspect the reconstituted NUZYRA solution for particulate matter and discoloration prior to further dilution and administration. If necessary, invert the vial to dissolve any remaining powder and swirl gently to prevent foaming. Immediately (within 1 hour), withdraw 5 mL or 10 ml of the reconstituted solution and further dilute to a 100 mL (nominal volume) of 0.9% Sodium Chloride Injection, USP, or 5% Dextrose Injection, USP, bag for injection. The concentration of the final diluted infusion solution will either be 1 mg/mL or 2 mg/mL in accordance with Table 3 below. Discard any unused portion of the reconstituted solution. The NUZYRA diluted infusion solution may be used within 24 hours at room temperature (less than or equal to 25°C) or within 48 hours when refrigerated (2°C to 8°C). When storing the infusion solution in the refrigerator, the infusion bag should be removed from the refrigerator and incubated in a vertical position at room temperature 60 minutes before use. Do not freeze. After reconstitution and dilution, administer NUZYRA by intravenous infusion, using a total infusion time of 60 minutes for a 200-mg dose, or a total infusion time of 30 minutes for a 100-mg dose [see Dosage and Administration (2.2, 2.3)]. Administer NUZYRA intravenously through a dedicated line or through a Y-site. If the same intravenous line is used for sequential infusion of several drugs, the line should be flushed with 0.9% Sodium Chloride Injection, USP, or 5% Dextrose Injection, USP, before and after infusion of NUZYRA. The compatibility of NUZYRA with other drugs and infusion solutions other than 5% Dextrose Injection, USP or 0.9% Sodium Chloride Injection, USP has not been established. Each single-dose vial contains 100 mg omadacycline (equivalent to 131 mg omadacycline tosylate) which must be reconstituted and further diluted prior to intravenous infusion. The lyophilized powder is a yellow to dark orange cake. Each tablet contains 150 mg of omadacycline (equivalent to 196 mg omadacycline tosylate) in yellow, diamond-shaped, film-coated tablets debossed with OMC on one side and 150 on the other side. 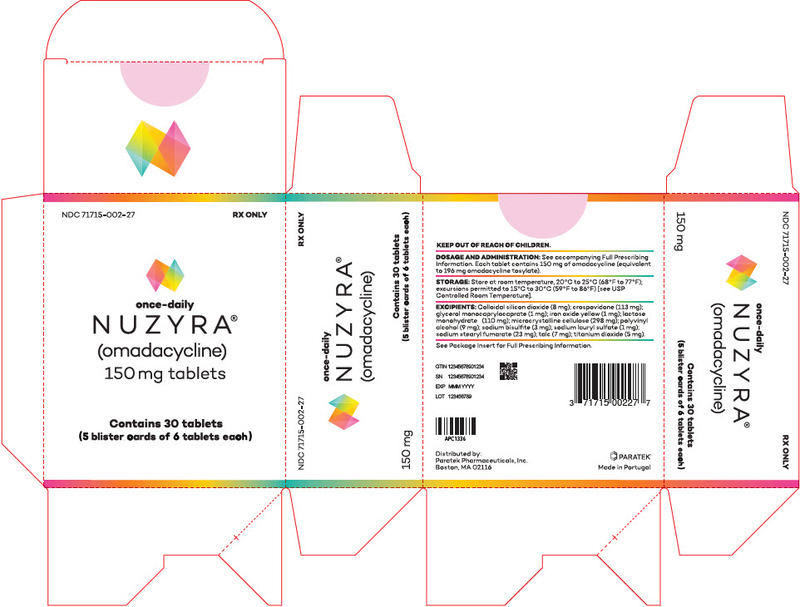 NUZYRA is contraindicated in patients with known hypersensitivity to omadacycline or tetracycline-class antibacterial drugs, or to any of the excipients [see Warnings and Precautions (5.3) and Adverse Reactions (6.1)]. Mortality imbalance was observed in the CABP clinical trial with eight deaths (2%) occurring in patients treated with NUZYRA compared to four deaths (1%) in patients treated with moxifloxacin. The cause of the mortality imbalance has not been established. All deaths, in both treatment arms, occurred in patients > 65 years of age; most patients had multiple comorbidities [see Use in Specific Populations (8.5)]. The causes of death varied and included worsening and/or complications of infection and underlying conditions. Closely monitor clinical response to therapy in CABP patients, particularly in those at higher risk for mortality [see Adverse Reactions (6.1)]. The use of NUZYRA during tooth development (last half of pregnancy, infancy, and childhood up to the age of 8 years) may cause permanent discoloration of the teeth (yellow-gray-brown). This adverse reaction is more common during long-term use of the tetracycline class drugs, but it has been observed following repeated short-term courses. Enamel hypoplasia has also been reported with tetracycline class drugs. Advise the patient of the potential risk to the fetus if NUZYRA is used during the second or third trimester of pregnancy [see Use in Specific Populations (8.1, 8.4)]. The use of NUZYRA during the second and third trimester of pregnancy, infancy and childhood up to the age of 8 years may cause reversible inhibition of bone growth. All tetracyclines form a stable calcium complex in any bone-forming tissue. A decrease in fibula growth rate has been observed in premature infants given oral tetracycline in doses of 25 mg/kg every 6 hours. This reaction was shown to be reversible when the drug was discontinued. Advise the patient of the potential risk to the fetus if NUZYRA is used during the second or third trimester of pregnancy [see Use in Specific Populations (8.1, 8.4)]. Hypersensitivity reactions have been reported with NUZYRA [see Adverse Reactions (6.1)]. Life-threatening hypersensitivity (anaphylactic) reactions have been reported with other tetracycline-class antibacterial drugs. NUZYRA is structurally similar to other tetracycline-class antibacterial drugs and is contraindicated in patients with known hypersensitivity to tetracycline-class antibacterial drugs [see Contraindications (4)]. Discontinue NUZYRA if an allergic reaction occurs. Clostridium difficile associated diarrhea (CDAD) has been reported with use of nearly all antibacterial agents and may range in severity from mild diarrhea to fatal colitis. Treatment with antibacterial agents alters the normal flora of the colon leading to overgrowth of C. difficile. Prescribing NUZYRA in the absence of a proven or strongly suspected bacterial infection is unlikely to provide benefit to the patient and increases the risk of the development of drug-resistant bacteria [see Indications and Usage (1.3)]. NUZYRA was evaluated in three Phase 3 clinical trials (Trial 1, Trial 2 and Trial 3). These trials included a single Phase 3 trial in CABP patients (Trial 1) and two Phase 3 trials in ABSSSI patients (Trial 2 and Trial 3). Across all Phase 3 trials, a total of 1073 patients were treated with NUZYRA (382 patients in Trial 1 and 691 in Trials 2 and 3 of which 368 patients were treated with only oral NUZYRA. Trial 1 was a Phase 3 CABP trial that enrolled 774 adult patients, 386 randomized to NUZYRA (382 received at least one dose of NUZYRA and 4 patients did not receive the study drug) and 388 randomized to moxifloxacin (all 388 received at least one dose of moxifloxacin). The mean age of patients treated with NUZYRA was 61 years (range 19 to 97 years) and 42% were greater than or equal to 65 years of age. Overall, patients treated with NUZYRA were predominantly male (53.7%), white (92.4%), and had a mean body mass index (BMI) of 27.3 kg/m2. Approximately 47% of NUZYRA treated patients had CrCl <90 ml/min. Patients were administered an IV to oral switch dosage regimen of NUZYRA. The total treatment duration was 7 to 14 days. Mean duration of IV treatment was 5.7 days and mean total duration of treatment was 9.6 days in both treatment arms. In Trial 1, eight deaths (2%) occurred in 382 patients treated with NUZYRA as compared to four deaths (1%) in 388 patients treated with moxifloxacin. All deaths, in both treatment arms, occurred in patients >65 years of age. The causes of death varied and included worsening and/or complications of infection and underlying conditions. The cause of the mortality imbalance has not been established [see Warnings and Precautions (5.1)]. In Trial 1, a total of 23/382 (6.0%) patients treated with NUZYRA and 26/388 (6.7%) patients treated with moxifloxacin experienced serious adverse reactions. Discontinuation of treatment due to any adverse reactions occurred in 21/382 (5.5%) patients treated with NUZYRA and 27/388 (7.0%) patients treated with moxifloxacin. Table 4 lists the most common adverse reactions occurring in ≥2% of patients receiving NUZYRA in Trial 1. Trial 2 was a Phase 3 ABSSSI trial that enrolled 655 adult patients, 329 randomized to NUZYRA and 326 randomized to linezolid. Trial 3 was a Phase 3 ABSSSI trial that enrolled 735 adult patients, 368 randomized to NUZYRA and 367 randomized to linezolid. In Trial 2 (IV to oral switch trial), the mean age of patients treated with NUZYRA was 47 years (range 19 to 88). Overall, patients treated with NUZYRA were predominantly male (62.8%), white (91.0%) and had a mean BMI of 28. kg/m2. In Trial 3 (oral only trial), the mean age of patients was 43 years (range 18 to 86). Patients treated with NUZYRA were predominantly male (65.8%), white (88.9%), and had a mean BMI of 27.9 kg/m2. In Trials 2 and 3, approximately 12% of NUZYRA treated patients had CrCl <90 ml/min. Overall, the mean and median calculated lesion area was similar across both trials. Trial 2 required at least 3 days of IV treatment followed by switch to oral regimen based on physician's discretion. Mean duration of IV treatment in Trial 2 was 4 days and mean total duration of treatment was 9 days in both treatment arms. In Trial 3, only oral therapy was administered, and mean total duration of treatment was 8 days in both treatment arms. The median days on treatment in the pooled ABSSSI trials was 9 days for both NUZYRA and linezolid. In the pooled ABSSSI trials, serious adverse reactions occurred in 16/691 (2.3%) of patients treated with NUZYRA and 13/689 (1.9%) of patients treated with comparator. Discontinuation of treatment due to adverse events occurred in 12 (1.7%) NUZYRA treated patients, and 10 (1.5%) comparator treated patients. There was 1 death (0.1%) reported in NUZYRA treated patients and 3 deaths (0.4%) reported in linezolid patients in ABSSSI trials. Table 5 includes the most common adverse reactions occurring in ≥2% of patients receiving NUZYRA in Trials 2 and 3. In Trial 2, which included IV to oral dosing of NUZYRA, 40 (12%) patients experienced nausea and 17 (5%) patients experienced vomiting in NUZYRA treatment group as compared to 32 (10%) patients experienced nausea and 16 (5%) patients experienced vomiting in the comparator group. One patient (0.3%) in the NUZYRA group discontinued treatment due to nausea and vomiting. Infusion site extravasation, pain, erythema, swelling, inflammation, irritation, peripheral swelling and skin induration. The following selected adverse reactions were reported in NUZYRA-treated patients at a rate of less than 2% in Trials 1, 2 and 3. Because tetracyclines have been shown to depress plasma prothrombin activity, patients who are on anticoagulant therapy may require downward adjustment of their anticoagulant dosage while also taking NUZYRA. Absorption of oral tetracyclines, including NUZYRA, is impaired by antacids containing aluminum, calcium, or magnesium, bismuth subsalicylate, and iron containing preparations [see Dosage and Administration (2.1)]. NUZYRA, like other tetracycline-class antibacterial drugs, may cause discoloration of deciduous teeth and reversible inhibition of bone growth when administered during the second and third trimester of pregnancy [see Warnings and Precautions (5.2, 5.3), Data, Use in Specific Populations (8.4)]. The limited available data of NUZYRA use in pregnant women is insufficient to inform drug associated risk of major birth defects and miscarriages. Animal studies indicate that administration of omadacycline during the period of organogenesis resulted in fetal loss and/or congenital malformations in pregnant rats and rabbits at 7 times and 3 times the mean AUC exposure, respectively, of the clinical intravenous dose of 100-mg and the oral dose of 300-mg. Reductions in fetal weight occurred in rats at all administered doses (see Data). In a fertility study, administration to rats during mating and early pregnancy resulted in embryo loss at 20 mg/kg/day; systemic exposure based on AUC was approximately equal to the clinical exposure level [see Nonclinical Toxicology (13.1)]. Results of studies in rats with omadacycline have shown tooth discoloration. The estimated background risk of major birth defects and miscarriage for the indicated population is unknown. All pregnancies have a background risk of birth defect, loss, or other adverse outcomes. In the U.S. general population, the estimated background risk of major birth defects and miscarriage in clinically recognized pregnancies is 2 to 4% and 15-20%. Intravenous infusion of omadacycline to pregnant rats during organogenesis (gestation days 6-17) at doses of 5 to 80 mg/kg/day resulted in maternal lethality at 80 mg/kg/day. Increased embryo-fetal lethality and fetal malformations (whole body edema) occurred at 60 mg/kg/day (7 times the clinical AUC), dose-dependent reductions in fetal body weight occurred at all doses, and delayed skeletal ossification occurred at doses as low as 10 mg/kg/day (Systemic exposure based on AUC at a similar dose in unmated female rats in a separate study was approximately half the clinical exposure). In pregnant rabbits, intravenous infusion of 5, 10 or 20 mg/kg/day during organogenesis (gestation days 7-18) resulted in maternal lethality and body weight loss at 20 mg/kg/day. Embryo-fetal lethality, congenital malformations of the skeleton, and reduced fetal weight also occurred at 20 mg/kg/day (7 times the clinical AUC). Cardiac and lung malformations were present in dose-related incidence at 10 and 20 mg/kg/day. The fetal no-adverse-effect-level in the rabbit embryo-fetal development study was 5 mg/kg/day, at approximately 1.2 times the clinical steady state AUC. Intravenous infusion of omadacycline to pregnant and lactating rats at doses of 7.5, 15 and 30 mg/kg/day did not adversely affect survival, growth (other than lower pup body weights and/or gains at the high dose that were only statistically significant at sporadic intervals), postnatal development, behavior, or reproductive capability of offspring at maternal doses up to 30 mg/kg/day (approximately equivalent to 3 times the IV clinical dose of 100 mg/day, based on doses normalized for total body surface area), the highest dose tested, although dosing was discontinued early in a number of animals in this group due to injection site intolerance. Results of animal studies indicate that tetracyclines cross the placenta, are found in fetal tissues, and can have toxic effects on the developing fetus (often related to retardation of skeletal development). Evidence of embryotoxicity also has been noted in animals treated early in pregnancy. There is no information on the presence of omadacycline in human milk, the effects on the breastfed infant or the effects on milk production. Tetracyclines are excreted in human milk; however, the extent of absorption of tetracyclines, including omadacycline, by the breastfed infant is not known. Because there are other antibacterial drug options available to treat CABP and ABSSSI in lactating women and because of the potential for serious adverse reactions, including tooth discoloration and inhibition of bone growth, advise patients that breastfeeding is not recommended during treatment with NUZYRA and for 4 days (based on half-life) after the last dose. NUZYRA may produce embryonic or fetal harm [see Use in Specific Populations (8.1)]. Advise patients to use an acceptable form of contraception while taking NUZYRA. In rat studies, injury to the testis and reduced sperm counts and motility occurred in male rats after treatment with omadacycline [see Nonclinical Toxicology (13.1)]. In rat studies, omadacycline affected fertility parameters in female rats, resulting in reduced ovulation and increased embryonic loss at intended human exposures [see Nonclinical Toxicology (13.1)]. Safety and effectiveness of NUZYRA in pediatric patients below the age of 18 years have not been established. Of the total number of patients who received NUZYRA in the Phase 3 clinical trials (n=1073), 200 patients were ≥ 65 years of age, including 92 patients who were ≥75 years of age. In Trial 1, numerically lower clinical success rates at early clinical response (ECR) timepoint for NUZYRA-treated and moxifloxacin-treated patients (75.5% and 78.7%, respectively) were observed in CABP patients ≥ 65 years of age as compared to patients <65 years of age (85.2% and 86.3%, respectively). Additionally, all deaths in the CABP trial occurred in patients >65 years of age [see Adverse Reactions (6.1)]. No significant difference in NUZYRA exposure was observed between healthy elderly subjects and younger subjects following a single 100-mg IV dose of NUZYRA [see Clinical Pharmacology (12.3)]. No dose adjustment of NUZYRA is warranted in patients with mild, moderate, or severe hepatic insufficiency (Child-Pugh classes A, B, or C) [see Clinical Pharmacology (12.3)]. No dose adjustment of NUZYRA is warranted in patients with mild, moderate, or severe renal impairment, including patients with end stage renal disease who are receiving hemodialysis [see Clinical Pharmacology (12.3)]. No specific information is available on the treatment of overdosage with NUZYRA. Following a 100 mg single dose intravenous administration of omadacycline, 8.9% of dose is recovered in the dialysate. 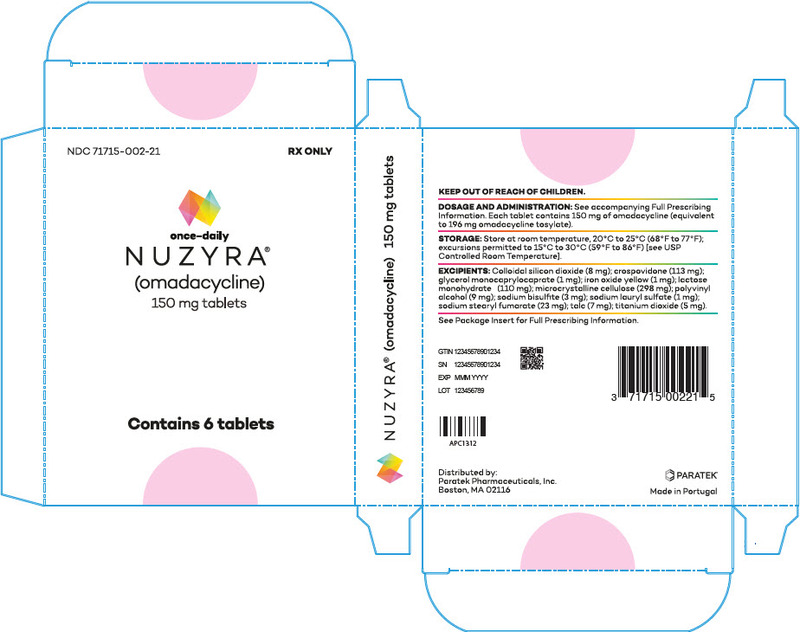 NUZYRA contains omadacycline tosylate, an aminomethylcycline which is a semisynthetic derivative of the tetracycline class of antibacterial drugs, for intravenous or oral administration. The chemical name of omadacycline tosylate is (4S,4aS,5aR,12aS)-4,7-bis(dimethylamino)-9-(2,2-dimethylpropylaminomethyl)-3,10,12,12a-tetrahydroxy-1,11-dioxo-1,4,4a,5,5a,6,11,12a-octahydrotetracene-2-carboxamide, 4-methylbenzenesulfonate. NUZYRA (omadacycline) for injection is a yellow to dark orange sterile lyophilized powder. Each vial of NUZYRA for injection contains 100 mg of omadacycline (equivalent to 131 mg omadacycline tosylate). Inactive ingredients: Sucrose (100 mg). NUZYRA (omadacycline) tablets for oral administration are yellow film coated tablets containing 150 mg of omadacycline (equivalent to 196 mg omadacycline tosylate), and the following inactive ingredients: Colloidal silicon dioxide, crospovidone, glycerol monocaprylocaprate, iron oxide yellow, lactose monohydrate, microcrystalline cellulose, polyvinyl alcohol, sodium bisulfite, sodium lauryl sulfate, sodium stearyl fumarate, talc, and titanium dioxide. Based on the nonclinical and clinical data, including electrocardiogram evaluation in the phase 3 clinical trials, one of which had moxifloxacin as a control group, no clinically relevant QTc prolongation was observed at the maximum recommended dose of omadacycline. In phase 1 studies conducted in healthy volunteers, transient dose-dependent increases in heart rate have been observed following administration of single and multiple doses of omadacycline. The clinical implication of this finding is unknown [see Adverse Reactions (6.1)]. In a standard radiolabeled ligand binding assays, omadacycline was shown to inhibit binding of H-scopolamine to the M2 subtype of the muscarinic acetylcholine receptor. In the heart, muscarinic M2 receptors serve as mediators of the parasympathetic input that normally is received via the vagus nerve and stimulation of the receptor increases membrane potassium conductance through the acetylcholine-dependent channel, which slows depolarization and reduces pacemaker activity in the sinoatrial node. The pharmacokinetic parameters of NUZYRA after single and multiple oral and intravenous doses are summarized in Table 6. Dose Proportionality Dose proportional increases in omadacycline Cmax and AUC following single oral doses of NUZYRA from 300 to 450 mg. The exposure to omadacycline is similar between a 300-mg oral dose and a 100-mg intravenous dose of NUZYRA in healthy fasted subjects. Ingestion of a standard high-fat nondairy meal (855 calories; 59% calories from fat) and standard high-fat meal including dairy (985 calories; 60% calories from fat) 2-hours before administration of a single 300-mg oral dose of NUZYRA decreased the rate (Cmax) and extent of absorption (AUC) by 40% and 42%, and 59% and 63%, respectively compared to administration of NUZYRA under fasting conditions. The rate and extent of absorption of NUZYRA were not substantially decreased when a high-fat nondairy meal (800-1000 calories; 50% calories from fat) was ingested 4 hours pre-dose. Following ingestion of either a light non-fat (300-350 calories; ≤5% calories from fat), or a standard low-fat (800-1000 calories; 30% calories from fat), or a standard high fat (800-1000 calories; 50% calories from fat) meal 2 hours post-dose, the AUC and Cmax were not substantially altered, as compared to fasting conditions. Plasma protein binding of omadacycline is approximately 20% and is not concentration dependent. The mean (% CV) volume of distribution of omadacycline at steady-state following IV administration of NUZYRA in healthy subjects was 190 (27.7) L.
Renal clearance of omadacycline following IV administration of NUZYRA ranged from 2.4 to 3.3 L/h in healthy subjects. In vitro studies using human liver microsomes and hepatocytes demonstrated that omadacycline is not metabolized. Following a 100-mg IV dose of NUZYRA, 27% of the dose was recovered as unchanged omadacycline in the urine. In healthy male volunteers receiving 300-mg oral [14C] NUZYRA, 77.5% to 84.0% of the dose was recovered in the feces, approximately 14.4 % (range 10.8% to 17.4%) in the urine, with 95.5% of the administered radioactive dose recovered after 7 days. The mean omadacycline concentrations over time for alveolar cells (AC), epithelial lining fluid (ELF), and plasma following IV administration of multiple doses of 100-mg of NUZYRA to healthy volunteers are shown in Figure 1. The steady-state omadacycline AUC0-24h (302.5 hr*mcg/mL) in AC was 25.8-fold higher than the plasma AUC0-24h, and the AUC0-24h (17.2 hr*mcg/mL) in ELF was 1.5-fold higher than the AUC0-24h in plasma. No clinically significant differences in the pharmacokinetics of omadacycline were observed based on age, gender, race, weight, renal impairment or end-stage renal disease, and hepatic impairment. A study was conducted to compare NUZYRA pharmacokinetics following 100-mg IV administration in 8 subjects with end-stage renal disease (ESRD) on stable hemodialysis, with and 8 -matched healthy control subjects. In the ESRD subjects, NUZYRA was administered on two separate occasions; immediately prior to dialysis and after dialysis, and the AUC, Cmax, and CL of NUZYRA were comparable between the renally impaired subjects and the matching healthy subjects. During dialysis, 7.9% of omadacycline was recovered in the dialysate. Renal impairment did not impact NUZYRA elimination. A study was conducted to compare NUZYRA pharmacokinetics following intravenous and oral dosing to 5 subjects with mild hepatic impairment (Child-Pugh Class A), 6 subjects with moderate hepatic impairment (Child-Pugh Class B), and 6 subjects with severe hepatic impairment (Child-Pugh Class C) as compared to 12 matched healthy control subjects. The AUC and Cmax of NUZYRA were comparable between the hepatically impaired subjects and the matching healthy subjects, and similar clearance was observed across all cohorts. Hepatic impairment did not impact NUZYRA elimination. Administration of oral verapamil (P-gp inhibitor) two hours prior to a single 300 mg oral dose of NUZYRA increased omadacycline AUC by approximately 25% and Cmax by approximately 9%. In-vitro studies in human liver microsomes indicate that omadacycline does not inhibit nor induce metabolism mediated by CYP 1A1, 1A2, 2A6, 2B6, 2C8, 2C9, 2C19, 2D6, and 3A4/5, or UGT1A1. Therefore, NUZYRA is not expected to alter the pharmacokinetics of drugs metabolized by the above stated human hepatic enzymes. Omadacycline is not an inhibitor of P-gp and organic anion transporting polypeptide (OATP) 1B1 and OATP1B3. Omadacycline is a substrate of P- gp (see Clinical Studies above). Omadacycline is not a substrate or inhibitor of the major organic anion transporters (OAT-1 and 3), breast cancer resistance protein (BCRP), or multidrug resistance-associated protein 2 (MRP2). Omadacycline was not an OATP1B1 or OATP1B3 substrate at supra-therapeutic concentrations (5-13 fold higher than clinically relevant concentrations). Omadacycline is an aminomethylcycline antibacterial within the tetracycline class of antibacterial drugs. Omadacycline binds to the 30S ribosomal subunit and blocks protein synthesis. Omadacycline is active in vitro against Gram positive bacteria expressing tetracycline resistance active efflux pumps (tetK and tet L) and ribosomal protection proteins (tet M). In general, omadacycline is considered bacteriostatic; however, omadacycline has demonstrated bactericidal activity against some isolates of S. pneumoniae and H. influenzae. The following in vitro data are available, but their clinical significance is unknown. Omadacycline was active in vitro against Gram positive bacteria that carried ribosomal protection genes (tet M) and efflux genes (tet K and tet L), and in Enterobactericeae that carried the tetB efflux gene. Additionally, omadacycline was active against some S. aureus, S. pneumoniae, and H. influenzae strains carrying macrolide resistance genes (erm A, B and/or C), or ciprofloxacin resistance genes (gyrA and parC) and beta-lactamase positive H. influenzae. In vitro studies have not demonstrated antagonism between omadacycline and other commonly used antibacterials (ampicillin, ceftazidime, ceftriaxone, imipenem, piperacillin/tazobactam, gentamicin, vancomycin, daptomycin, linezolid). Omadacycline has been shown to be active against the following bacteria, both in vitro and in clinical infections [see Indications and Usage (1.1, 1.2)]. At least 90% of isolates of the following microorganisms exhibit an in-vitro minimum inhibitory concentration (MIC) less than or equal to the susceptible breakpoint for NUZYRA. However, the safety and effectiveness of NUZYRA in treating clinical infections due to these microorganisms have not been established in adequate and well controlled clinical trials. Carcinogenicity studies with omadacycline have not been conducted. However, there has been evidence of oncogenic activity in rats in studies with the related antibacterial drugs, oxytetracycline (adrenal and pituitary tumors), and minocycline (thyroid tumors). Omadacycline was positive for clastogenicity and aneugenicity in an in-vitro chromosome aberration assay in Chinese hamster ovary (CHO) cells and for mutagenicity in an in-vitro forward mutation assay in mouse lymphoma cells. These effects were seen in the presence of metabolizing enzymes. Omadacycline was negative in a chromosomal aberration test in Chinese hamster V79 cells and in-vivo micronucleus assays administered intraperitoneally to ICR mice or intravenously to HanRcc: WIST rats. Omadacycline administration to male rats in a fertility study caused reduced sperm counts and sperm motility at 20-mg/kg/day (approximately 1.3 times clinical systemic exposure, based on AUC in a separate study in rats at a similar dose), but had no effect on male fertility parameters. In general toxicity studies, inhibition of spermatogenesis occurred after administration of 45-mg/kg/day omadacycline (6 to 8 times the clinical AUC exposure) for 37 days or longer, but not at lower doses (15-mg/kg/day, ≤ 2 times clinical AUC exposure) or shorter treatment periods (4 weeks or less). In female rats, fertility was reduced at the 20-mg/kg/day dose (approximately equivalent to human exposures in a separate study in unmated females), characterized by reduced ovulation and increased embryonic loss when treatment occurred from before mating through early pregnancy. Hyperpigmentation of the thyroid has been produced by members of the tetracycline class in the following species: in rats by omadacycline, oxytetracycline, doxycycline, tetracycline PO4, and methacycline; in minipigs by doxycycline, minocycline, tetracycline PO4, and methacycline; in dogs by doxycycline and minocycline; in monkeys by omadacycline and minocycline. A total of 774 adults with CABP were randomized in a multinational, double-blind, double-dummy trial (Trial 1, NCT #02531438) comparing NUZYRA to moxifloxacin. NUZYRA was administered 100-mg intravenously every 12 hours for two doses on Day 1, followed by 100-mg intravenously daily, or 300-mg orally, daily. Moxifloxacin 400-mg was administered intravenously or orally daily. Total treatment duration was 7-14 days. All enrolled patients were expected to require a minimum of at least 3 days of intravenous treatment. Efficacy and safety of an oral loading dose was not evaluated in CABP. A total of 386 patients were randomized to NUZYRA and 388 patients were randomized to moxifloxacin. Patient demographic and baseline characteristics were balanced between the treatment groups. Patients were predominantly male (55%) and white (92%). Approximately 60% of patients in each group belonged to PORT Risk Class III, 26% were PORT Risk Class IV and 14.5% were PORT Risk Class II. The median age was 62 years, mean BMI was 27.34 kg/m2, and approximately 47% of NUZYRA treated patients had CrCl <90 ml/min. Among NUZYRA-treated patients, common comorbid conditions included hypertension (49.5%), diabetes mellitus (16.3%), chronic lung disease (21.2%), atrial fibrillation (10.1%), and coronary artery disease (9.1%). The majority of sites were in Eastern Europe, which accounted for 82% of enrollment; 3 patients were enrolled in the US. Clinical success at the early clinical response (ECR) timepoint, 72 to 120 hours after the first dose, was defined as survival with improvement in at least two of four symptoms (cough, sputum production, chest pain, dyspnea) without deterioration in any of these four symptoms in the intent to treat population (ITT), which consisted of all randomized patients. Table 7 presents the clinical success rates at the ECR timepoint (ITT population). * Clinical Success at the early clinical response (ECR) timepoint, 72 to 120 hours after the first dose, was defined as survival with improvement in at least two of four symptoms (cough, sputum production, chest pain, dyspnea) from baseline without deterioration in any of these symptoms, with no receipt of antibacterial treatment either as a rescue for CABP or as a treatment for other infections that may be effective for CABP, and no discontinuation of study treatment due to AE. Clinical response was also assessed by the investigator at the post therapy evaluation visit (PTE), 5 to 10 days after last dose of study drug and defined as survival and improvement in signs and symptoms of CABP, based on the clinician's judgment, to the extent that further antibacterial therapy is not necessary. Table 8 presents the results of clinical response at the PTE visit. Clinical response rates by most common baseline pathogen in the microbiological ITT (micro-ITT) population, defined as all randomized patients with a baseline pathogen are presented in Table 9. 95% confidence interval for the treatment difference. A total of 1390 adults with ABSSSI were randomized in two multicenter, multinational, double-blind, double-dummy trials (Trial 2 NCT #02378480 and Trial 3 NCT #02877927). Both trials compared 7 to 14 days of NUZYRA to linezolid. Patients with cellulitis, major abscess, or wound infection were enrolled in the trials. In Trial 2, 329 patients were randomized to NUZYRA (100-mg intravenously every 12 hours for 2 doses followed by 100-mg intravenously every 24 hours, with the option to switch to 300-mg orally every 24 hours) and 326 patients were randomized to linezolid (600-mg intravenously every 12 hours, with the option to switch to 600-mg orally every 12 hours). Patients in the trial had the following infections: cellulitis (38%), wound infection (33%) and major abscess (29%). The mean surface area of the infected lesion was 455 cm2 in NUZYRA-treated patients and 498 cm2 in linezolid-treated patients. The mean age of patients was 47 years. Subjects were predominantly male (65%) and white (92%), and mean BMI was 28.1 kg/m2. Among NUZYRA-treated patients, common comorbid conditions included drug abuse (53.9%), hepatitis C (29.1%), hypertension (20.4%), anxiety (19.5%), and depression (15.5%). Trial 2 was conducted globally including approximately 60% of patients enrolled in the United States. In Trial 3, 368 patients were randomized to NUZYRA (450-mg oral once a day on Days 1 and 2, followed by 300-mg orally once a day) and 367 were randomized to linezolid (600-mg orally every 12 hours). All patients were enrolled in the United States. Patients in the trial had the following infections: wound infections (58%), cellulitis (24%), and major abscess (18%). The mean surface area of the infected lesion was 424 cm2 in NUZYRA-treated patients and 399 cm2 in linezolid-treated patients. The mean age of patients was 44 years. Subjects were predominantly male (63%) and white (91%) and mean BMI was 27.9 kg/m2. The most common comorbid conditions included drug abuse (72.8%), tobacco use (12.0%), and chronic hepatitis C infection (31.5%). In Trials 2 and 3, approximately 12% of NUZYRA treated patients had CrCl <90 ml/min. In both trials, efficacy was determined by the successful early clinical response at 48 to 72 hours after the first dose in the mITT population and was defined as a 20% or greater decrease in lesion size. Table 10 summarizes the clinical response rates in the two trials. The mITT population was defined as all randomized subjects without a sole Gram-negative causative pathogen at screening. Clinical success at early clinical response (ECR) at 48 to 72 hours after the first dose, was defined as a 20% or greater decrease in lesion size without any reasons for failure (less than 20% reduction in lesion size, administration of rescue antibacterial therapy, use of another antibacterial or surgical procedure to treat for lack of efficacy, or death). Clinical response at the post therapy evaluation (PTE, 7 to 14 days after last dose) visit was defined as survival after completion of study treatment without receiving any alternative antibacterial therapy other than NUZYRA, without unplanned major surgical intervention, and sufficient resolution of infection such that further antibacterial therapy is not needed (see Table 11). Clinical response rates at PTE by most common pathogen in the microbiological-mITT population, defined as all patients in the mITT population, who had at least 1 Gram- positive causative pathogen identified at baseline are provided in Table 12. NUZYRA for Injection is supplied as a sterile lyophilized powder in a single-dose colorless glass vial, with each vial containing 100 mg of NUZYRA (equivalent to 131 mg omadacycline tosylate). They are supplied as follows: 100-mg single-dose vial (NDC 71715-001-02), packaged in cartons of 10. 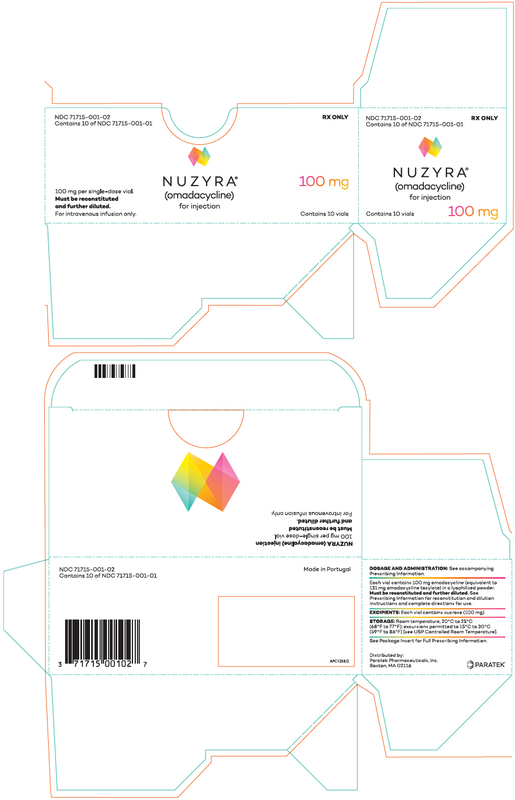 NUZYRA Tablets contains 150 mg of omadacycline (equivalent to 196 mg omadacycline tosylate) in yellow, diamond-shaped, film-coated tablets debossed with OMC on one side and 150 on the other side. NUZYRA for Injection and NUZYRA Tablets should be stored at 20°C to 25°C (68°F to 77°F); excursions permitted to 15°C to 30°C (59°F to 86°F) [see USP Controlled Room Temperature] [see Dosage and Administration (2.5)]. Do not freeze. Advise patients that nausea and vomiting can be an adverse reaction to NUZYRA. Advise patients that a greater proportion of patients who received the oral loading dose of NUZYRA for treatment of ABSSSI experienced nausea and vomiting. Advise patients that allergic reactions, including serious allergic reactions, could occur and that serious allergic reactions require immediate treatment. Ask the patient about any previous hypersensitivity reactions to NUZYRA, or other tetracycline class antibacterials [see Warnings and Precautions (5.4)]. Instruct patients to fast 4 hours before and 2 hours after taking NUZYRA tablets and not to consume dairy products, antacids, or multivitamins for 4 hours after taking NUZYRA tablets [see Dosage and Administration (2.1) and Clinical Pharmacology (12.3)]. Advise patients that NUZYRA, like other tetracycline-class drugs, may cause permanent tooth discoloration of deciduous teeth and reversible inhibition of bone growth when administered during the second and third trimesters of pregnancy. Tell your healthcare provider right away if you become pregnant during treatment [see Warnings and Precautions (5.1, 5.2) and Use in Specific Populations (8.1, 8.4)]. Advise patients that diarrhea is a common problem caused by antibacterial drugs, including NUZYRA, which usually ends when the antibacterial drugs is discontinued. Sometimes after starting treatment with antibacterial drugs, patients can develop watery or bloody stools (with or without stomach cramps and fever). If this occurs, patients should contact their physician as soon as possible. Inform patients that NUZYRA is similar to tetracycline-class antibacterial drugs and may have similar adverse reactions [see Warnings and Precautions (5.6)]. Advise patients that antibacterial drugs including NUZYRA should only be used to treat bacterial infections. They do not treat viral infections (e.g., the common cold). When NUZYRA is prescribed to treat a bacterial infection, patients should be told that although it is common to feel better early in the course of therapy, the medication should be taken exactly as directed. Skipping doses or not completing the full course of therapy may (1) decrease the effectiveness of the immediate treatment and (2) increase the likelihood that bacteria will develop resistance and will not be treatable by NUZYRA or other antibacterial drugs in the future. Copyright © 2018 Paratek Pharmaceuticals, Inc. All rights reserved. 100 mg per single-dose vial.